After landing that prized new job, take a moment to congratulate yourself on a successful job search! However, it’s now time to start formulating a plan to ensure you make a great first impression on your employer. After all, just as important as scoring a new position is succeeding in it. One way to help ensure success is to set aside some time to prepare and take care of any personal appointments and arrangements you need to make, so you're ready to focus on work when you start your new job. Your early days at a new job are very important because your employer is going to look for confirmation that you are a good fit for the position and for the organization. After all, the decision to hire a new employee is based on relatively limited information: how you performed in the interview, and in some cases, what your references said about you. Your employer is going to be watching to ensure that you can walk the walk, not just talk the talk. Accordingly, you need to be deliberate about creating the optimal image right from the beginning of your tenure. Be sure to take the time to prepare to start the job, so you can make a good impression on your new co-workers. Take care to gain the trust of your supervisor and your colleagues, establish positive relationships within your own department and outside of it, and ensure you are in a position to do your best work. This will create a very healthy foundation for your future with the company. Associate with positive people, and avoid complainers and slackers at all costs. Avoid griping to fellow employees since you never know who will quote you or cast you in a negative light. If someone starts complaining or gossiping directly to you, try to stay “neutral” if at all possible. If you can’t deflect or switch topics, then ask constructive questions instead. Identify star performers at your level and analyze what has made them successful in their roles. This can give you an idea of what skills, abilities or accomplishments are valued at the organization. Assess the preferences and expectations of your immediate supervisor. Listen carefully to the directions that he/she offers, and also ask other trusted colleagues for suggestions on ways to measure up to your supervisor's expectations. Keep your supervisor apprised of the status of your projects, so he or she is aware of the value that you’re adding to your department. Seek input and assistance when you are stumped, but try to avoid coming across as needy by asking numerous questions. Try to solve as many problems as possible on your own or with input from colleagues at your own level. If you do need to ask a question, preface it with the steps you’ve already taken to solve it on your own. Engage strategically in meetings and conversations. It’s understandable that you’ll have a lot to catch up on in a new job and may not have insights and opinions to share right out of the gate. However, sitting silently in meeting after meeting won’t make a great impression, either. Instead, aim to strike a balance between listening carefully (which will be extremely important in getting oriented) and speaking up or asking smart questions. Establish open communication channels with your supervisor and key team members, whether this takes the form of weekly meetings or recurring email or messenger updates. Not only will this give you the opportunity to keep your supervisor up-to-date with your accomplishments, but you’ll be able to group questions together so you can ask them at one rather than sporadically throughout the day or week. Endeavor to arrive earlier and/or stay later than your supervisor to prove you are ready to work hard. Develop positive working relationships with staff at all levels of the organization, with particular emphasis on the people with whom you’ll be working regularly. 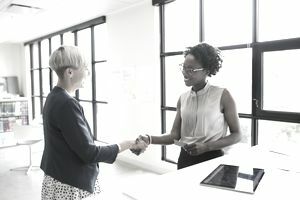 Not only will strong relationships enhance your overall work experience, but most organizations perform 360-degree evaluations of staff, so it is important to be on good terms with colleagues who may be evaluating you. Solicit feedback periodically and respond positively to constructive criticism. Make it clear to your supervisor and other staff that you are all about self-improvement. Create a professional development plan with clear goals and objectives outlining what you will learn and the skills you will acquire. Consult managers, the Human Resources department, or professionals in your field and find out what certifications, coursework and/or degrees would be impactful in advancing your career. Be mindful of how much time you take off during your first year. Since the first few months at a new job are crucial to getting you up to speed in a new position, you should avoid taking extended time off if at all possible, with the exception being a previously planned vacation that you disclosed during the interview process. If you do have to take time off for any reason, do everything that you can to ensure it does not negatively affect your output. Participate in office activities. Do your best to ingratiate yourself into the organization’s social happenings so you can get to know your colleagues on a personal level. That being said, starting a new job can be exhausting, and if attending numerous group activities simply feels like too much, focus on the most important and/or required events. If you find you connect better in one-on-one situations, ask a colleague to grab coffee or lunch instead. Join national and regional professional groups for your field and attend meetings and training sessions. Taking on leadership positions and volunteering for committees is a great way to make contacts and raise your visibility professionally. Review your social media accounts and make sure any personal information visible to the public reflects a professional image. Update your LinkedIn profile to include your current position or establish a profile if you don't already have one. Keep your profile up-to-date and cultivate it by connecting with new colleagues, joining relevant professional groups, and asking for recommendations from colleagues, clients, and other professional contacts over time. Identify potential mentors within your organization and get to know them. Consider senior staff as well as strong performers in positions at your level and/or one level above you. While you should recognize that these people are likely quite busy, asking to grab a coffee or simply taking a walk together can be a great start. Mentor former colleagues who are unemployed or underemployed, or offer to mentor junior staff in your organization. You never know when they may pay you back. Express your gratitude and maintain contact with any people, such as your references, who helped pave your way to this new job. These people will feel more invested in you the next time that you need their help if they can follow along as your career develops. Take care of yourself! Starting a new job can be mentally and physically taxing. However, you don’t want to burn yourself out in your early days. Be sure to take care of your health and spend some time doing activities that invigorate you. While you may feel like you have to dedicate every waking hour to this new position, doing so can quickly degrade your health and have a negative impact on your performance. Strive to maintain a healthy work-life balance right out of the gate. Lastly, in addition to the tips above, it can be a great idea to casually ask colleagues if they have any tips for getting up to speed, or what they wish they knew when they were starting out. Thinking strategically at the beginning of your new job is one way to ensure you are well received and successful in your position.